Hannah Genders sees a very special garden project come nearer to completion. It’s always exciting to be involved in a project that is a one-off idea and design – but the challenge of finding someone skilled enough to build what is in my head is a separate and more difficult issue. I am pleased to say that we have managed it for the Edward’s Trust garden and David Watkinson, who has done the sculptural work on the tree, has come up trumps. The garden is now starting to take shape. The site is the National Memorial Arboretum in Staffordshire and our plot is towards the bottom end of the site overlooking the river. 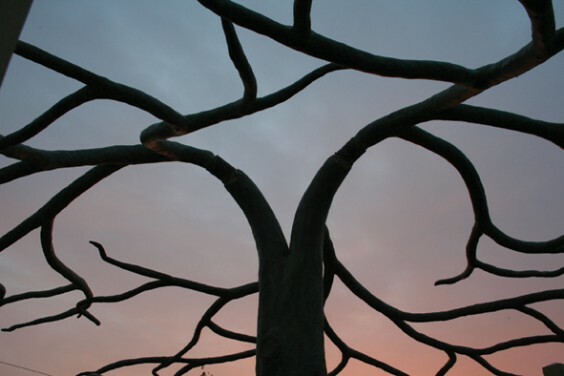 The support for the tree had been concreted in and the trellis posts were in place when the tree sculpture arrived on site a few weeks before Christmas. David had made the tree in four sections; the trunk as one whole and the branches in three separate parts. As the garden had really started to take shape at this point, we managed to get some good press on the day and a number of families who had lost children over the last year were also there as the important part of the story. These families had been involved with the Edward’s Trust charity, gaining support and counselling through the difficult times. It is always moving for me to meet the people for whom the garden is designed, and spurs me on to make it as beautiful as I can. The main focal point of the garden is the Tree of Life sculpture, which I designed so that families who have lost a child could hang a copper leaf on it, engraved with the name of the child who had died. This becomes a permanent memorial for the children and a special place the families can visit at any time of the year. The tree will be surrounded by a beautiful oak trellis, and seating inside this space will allow you to sit under the tree’s spreading branches – or you can sit outside this space in a woodland setting we’ll be creating if you need some private space. I was pleased with the design for the tree and to see it finally come to life is very exciting. As mentioned before, David had created the sculpture in parts so that we could assemble it on site. It has taken him about three months to construct at his workshop near Leeds and this was the first time I had seen it, other than the photos he emailed me at each stage of the build. The branches were fairly easy to lift into the garden space and we stopped for numerous photos with the families while the press were on site. The trunk, which he had built in one whole section, proved much more difficult; this is constructed from copper resin around a steel frame and it proved very heavy. It took six of us to lift it on to the garden space and then, as everyone else left, David, his assistant and myself were left to try and get the tree upright and on to the three steel rods sticking out of the ground, which had been concreted in as supports. When I tell you that the table the tree was resting on started to buckle, you can get an idea of the task ahead. It was a freezing cold day as well, so we were fortified with numerous cups of tea from the cafe on site, in between sawing off the metal rods in an attempt to get the tree swung over and down into place. I helped with the sawing as much to keep warm as to show willing! The final movements of the tree, into an upright position and then dropped on to the rods, was at best exciting to witness and in reality rather scary as it wobbled about in the air – I was just praying it wouldn’t topple and drop on any of us! This was “extreme sculpture”, like the group that does “extreme ironing” in dangerous places. Thankfully, though, it did finally drop into place and once the branches were fixed I was so moved to see how stunning it was, and so like the images I had drawn and sent to David. The whole sculpture has real movement and life with the branches bending over and making lovely patterns to look up through, but also being accessible to hang the leaves from. I am thrilled with it. The task now is to finish the path into the garden and under the tree. Some bronze leaves will also be set in drifts under the tree and these will contain the names of people who have helped to make this garden possible. Virtually all the money for the garden has been collected, but we are still a bit short and if anyone would like to make a donation towards this very special garden, I would be really grateful. Contact me through The Village, my business number or email (see opposite page). A big thank you to David Watkinson for the sculpture and Craig for the trellis.